Donald and Daisy Christmas Tree (Silver Prototype). Limited Edition size unknown. This is the Silver-finished prototype of Pin. Donald Duck surprises Daisy with an armload of gifts/presents on this colorful, holiday-themed silver-finished collector’s pin, a Disney Auctions exclusive. 1.75″ x 1.875″ MATERIALS: hard enamel Back of the pin has two posts, centered vertically. New on Original Backer. Released: December 4, 2003. 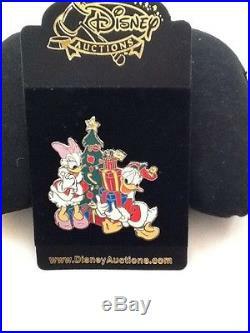 The item “Disney Auctions Donald and Daisy Christmas Tree (Silver Prototype) Pin” is in sale since Friday, May 20, 2016. This item is in the category “Collectibles\Disneyana\Contemporary (1968-Now)\Pins, Patches & Buttons\Disney Characters & Movies\Donald Duck”. The seller is “europeanimportsandgifts” and is located in Niles, Illinois. This item can be shipped to United States.